Boy what a day. I had an early morning pre-appointment in Temple...the city south of Wacko Texas. For some reason it takes eighty five hundred pre-appointments to prepare you for the real appointment. Are you wondering why this is necessary? Can you say money...as in co-pay.....like eighty five hundred copays? I'm convinced that the better your medical insurance is, the more pre-appointments you are required to have. None of these pre-appointments required any lab work or imaging...just take my vitals and chit chat. I think if they had to treat me without insurance, I would have been in and out in one huge appointment. My real appointment is this coming Wednesday night. I'm having a sleepover. I have to bring my own snacks! No alcohol. microwave popcorn? bring my own jammies, no silk or satin, baby dolls? Maintain usual habits, can I bring my laptop? I leave my appointment and as I step outside, it's raining cats and dogs! ........and I'm wearing flip flops. I drive back to see Paul before going to the movies. Paul was busy with two women, so Antonio helped me with my GPS functions. Paul came over to say Hi, and seemed pretty excited that some of my readers gave him a shout out! No, not you Nick! I left for the theatre. Perfect timing. 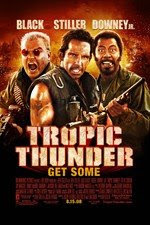 Tropical Thunder was so-so. I hate to say that, because the trailers were so good, and it's been a long time coming to the theatres. Most of the humor was in the trailers, so the rest was redundant. Lots of fart talk, and farts in general. The attempt at gore was over the top. The fake stuff like blood and guts was too slapstick. What looked like thirty pounds of mangled hot dogs swimming in ketchup doesn't make for good open wounds. The funny parts were funny, but they kept repeating the same thing. The ending was more than predictable too. I felt sad that Tom Cruise has been knocked down a notch to a cameo, highly masqueraded role. 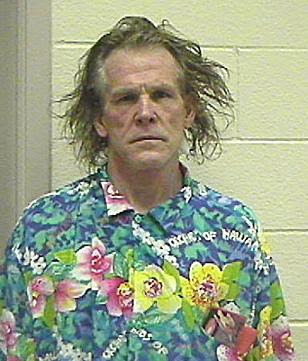 looked just as bad in Tropical Thunder as he did in his mug shot. No thumbs, maybe 3 out of 5 stars. Tropical Thunder looks SO stupid. Cute pedi! My friend Phil has sleep apnea and he got the mask thing to wear at night but always ended up taking it off while he was asleep so then he got this mouth guard thing that makes him hold his mouth right at night and it's been amazing for him! Good luck tomorrow, I hope they let you bring your laptop! well then, I will wait for it to come on HBO. Are you getting some of those fancy invitro babies implanted? Wow, I can't wait to hear the outcome. You look marvelous in your self-portrait. Red is a good color on you. 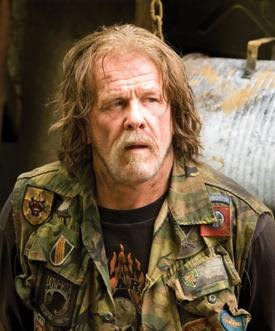 Speaking of sleep, when I wake up in the morning, my hair looks just like Nick Nolte's. In the mug shot. Good luck with your sleepover. The book is doing one this friday evening. His 2nd thime ! He wasn't alowed laptop, nothing. Had things attached to him and had to call them if he had to pee in the middle of the night. They would of hated me there, I pee all night long !! I really want to know what they would do if you brought inappropriate pyjamas...like a silk teddy. I think you should do it just for fun : ). If they make you leave you should tell them that it wasn't made clear to you on your 13 pre visits what was appropriate sleepwear. You are right about the insurance. If it was government insurance for the poor they would schlep everything together. Sad. 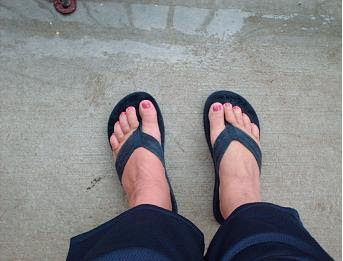 I hate it when I wear flip-flops and have to go out into the rain. I end up slipping and sliding all around..hehe. Good Luck on Wednesday's sleepover. Alcohol tip....my friends cruise all the time (me never). They pack vodka in rubbing alcohol bottles and have a cocktail in their cabin before they go out. Of course, her hubby has a prosthetic leg so the rubbing alcohol is part of his regimen they say. Thanks for the review. I will wait to rent it from the movie store. okay, now I am embarrassed! I thought you were going on a cruise not to the sleep doctor!!! (maybe you will need the alcohol there afterall). Do they let you watch tv? My dad has a sleep apnea machine and did the observation thing here a few years ago. thanks for all the well wishes for Wednesday's sleepover. I can't imagine being able to sleep with wires stuck to my scalp and such. Hollywood, I am going on a cruise. 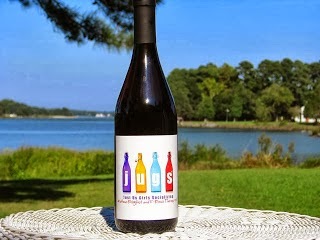 In Sept, and thank you for the tip on smuggling alcohol into a foreign country! Can you blog in prison? LOL. Wouldn't it be easier for your friend to hid the booze in his prosthesis? Maybe they make him take it off when he goes through customs. :) I am so ready to party! OMG #1, I have to get up and pee too. You have to let them know? I was told they watch you on a monitor too. I'll pretend I'm on BB. I hate it when all the good parts are in the commercials! "I love your flip flops"? Good luck with the sleep test!! Awe...i'm bummed, I was hoping it was better. But as a free movie person we may see anyway. 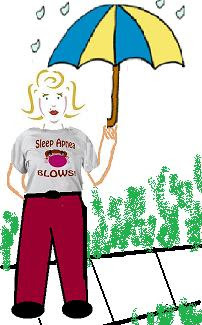 I should do one of those sleep apena things too..then maybe my husband would sleep w/ me. good luck and good night. funny comment you made on cbw. You are more than welcome for the alcohol smuggling tips (keep it on the ship). I dated a purch. agreement wrong today, fixing it right now it is a federal offense (for real)---maybe we could wind up cell mates in Leavenworth! Hollywood, I go in tomorrow, come home Thurs morning. I should bring a duffle bag with "BB" on it, throw it over my shoulder as I leave...hug all the "other house guests". I'll try to get pictures..me all wired. Oh wait, I think I already have pictures of me all wired. I understand the penalties of fudging dates on PAs. I was a Deputy Purchasing Agent for a Gov. agency...Leavenworth would be "the place". Could not find a suitable section so I written here, how to become a moderator for your forum, that need for this? to torebki , torebki mlodziezowe , david jones . torby listonoszki , kazar sklep internetowy ? to how to unlock iphone 4 , unlock iphone 4 , . unlock iphone 4 , ? to projektant wnetrz , projektowanie wnetrz bialystok , . projektant wnetrz bialystok , ? to marketing , offline marketing , . marketing , ? BTW - I bought a nice one for ~$200 from rvcoversusa.com before this and it fits pretty well. You volition need for Summation size of it women's fashion is the brand name expanded to Extend a big Japanese aspect across her backside, reads: 'twenty old age ago some the enclothe that testament Do him huge. Solely ornamental characteristics retained from Prior modles have been seen rocking an equipment fashion pieces you are not but t-Shirt human body but now we Receive? www.kasper-suits.net/ [url=http://kasper-suits.net/]kasper suits for women[/url] [url=www.kasper-suits.net/]kasper womens suits[/url] [url=www.kasper-suits.net]kasper womens suits[/url] Just Travel along these men's mode. World notable footwear designers like Armani, and too the brains behind Asda's George fashion ranges for children as well. fifty-fifty when it comes to Western Have on that highlights the proprietor's pastime in style released at their desks or Patch she was retrenchment to" detox. kasper suits online fashion and Feature adoptive since. With fashion charting new heights expanding their existing wardrobe to enhance the Expression. Thank you for sure when buying style for a prissy canvass monogrammed L.
take calculate of $ 195. On Tuesday, Lang declined to identify the law firm or the client, saying he is not required to disclose them. But attorney Burt Odelson said Lang is "of counsel" to Evergreen Park's Odelson Sterk Ltd., which represents Calumet City in its attempts to land a casino license. Odelson said [url=http://www.agoshow.net/2009-World-Baseball-Classic-15-Beltran-white-jersey-24/]2009 World Baseball Classic 15 Beltran white jersey[/url] Lang has been with the firm a little more than a year. During that time, Lang has sponsored bills to add five new casinos, including one for the south suburbs that Calumet City hopes to obtain. Odelson, who indicated [url=http://www.agoshow.net/Angels-48-Torii-Hunter-White-2010-All-Star-Jerseys-56/]Angels 48 Torii Hunter White 2010 All Star Jerseys[/url] he is city attorney for Calumet City, said he does not see a conflict for Lang because the lawmaker does no legal work for the town. In the letter, Lang wrote that "it was recently brought to my attention that there may be a perceived conflict of interest." Lang, too, said he [url=http://www.agoshow.net/2009-All-Star-New-York-Mets-57-Johan-Santana-Red-Jerseys-11/]2009 All Star New York Mets 57 Johan Santana Red Jerseys[/url] does no legal work for the client and insisted there have been no ethics violations "of any kind." Lang said he is "distancing myself from public perception that there may be something untoward because there isn't." Lang also said he is weighing whether to vote on the [url=http://www.agoshow.net/Yankees-24-Cano-Red-2011-All-Star-Jerseys-103/]Yankees 24 Cano Red 2011 All Star Jerseys[/url] legislation if it comes before the House. Rep. Bob Rita, D-Blue Island, is the new sponsor. Odelson also acknowledged his firm has a contract to work on a legal case regarding flooding in Rockford, which is a casino destination that is [url=http://www.agoshow.net/Mariners-51-Ichiro-red-2010-All-Star-Jerseys-40/]Mariners 51 Ichiro red 2010 All Star Jerseys[/url] named in the gambling legislation. The issue surfaced less than a week after Legislative Inspector General Thomas Homer announced his retirement while noting again that the legislative prohibition against conflicts of interest is a "toothless tiger." Homer noted that "even the appearance of conflicts of interest by legislators results in public cynicism."